Both stress and digestive problems can be an issue for many women during any stage of their lives, but they can be particularly troublesome during times of hormonal imbalance, like menopause. These two symptoms may prove complicated to deal with, since each one may worsen the other one. Furthermore, the wide range of other symptoms of menopause can cause stress in itself, which can easily worsen digestive problems and other symptoms. Fortunately, there are easy ways to break this vicious cycle, such as specific exercises that will promote a good digestion and lower stress levels. Continue reading to discover three that will help with both issues. Power walking is a simple and effective way to begin a new exercise regime, especially if your initial fitness level is low. Power walking is free and easy. Simply walking around your neighborhood can have a hugely positive effect upon your emotional well being, and moving around can ease many of the symptoms that are associated with menopause. The constantly quickening pace will also quickly promote faster and more efficient movements between the digestive organs, lessening digestive issues. Yoga can be a calming and settling exercise, and one of the most helpful when it comes to lower stress levels and aid menopausal digestive problems. Look around for a local yoga class in the gym or community center to release stress through exercise, while socializing with other people at the same time. However, if you prefer to exercise in the comfort of your own home, there are a range of DVDs and YouTube videos available which can help you. Going swimming is a great way to exercise if you prefer lower impact routines. 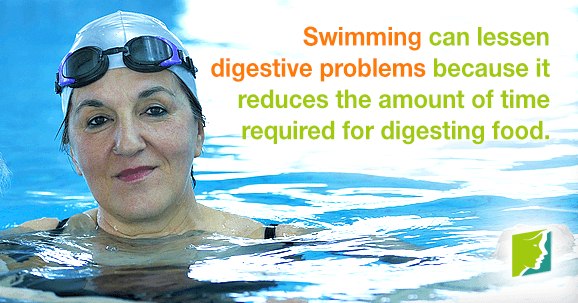 Swimming can keep your digestive tract healthy, by helping to reduce the length of time that it takes the food you eat to be digested. Going swimming two or three times a week can help to reduce stress, which should have a positive impact upon other menopause symptoms. Exercise is one of the best ways in which you can control menopausal digestive problems. Click here to learn more about more menopause treatments.